I am posted this because many of the projects I am working on are presents for Christmas. I do not want to spoil the surprise for some of the people lucky enough to get a homemade gift. My dear Mom is to get one of the handmade gifts. Please do not tell her (you know who you are). 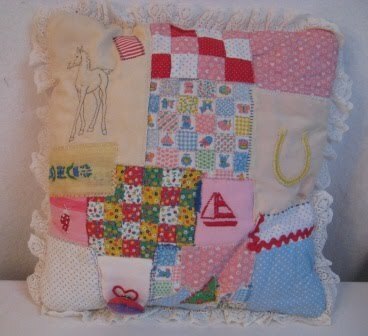 I made this pillow in Grade 9 so many many years ago. 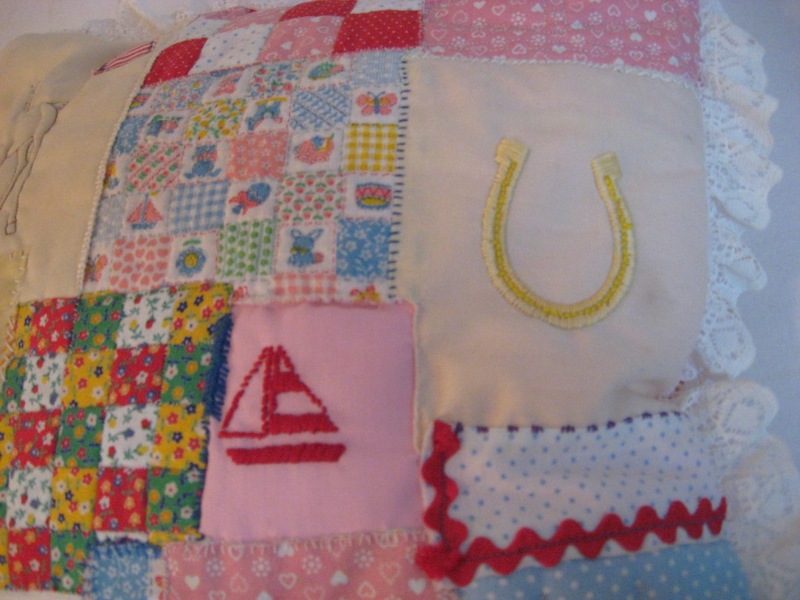 My mom was quilting back then and I had done lots of cross stitch at the time. I had hand sewn some stuffed animals and fluffy pillows from kits. I still have one of them in my sewing room. For grade nine Home Ec we had to do some project the teacher led us in and then we got to work on our choice. I wanted to do hand work. I made mini patch work by hand. I stitched the baby horse with batting and the very tiniest of stitches. I look at those stitches now and can't believe it was me. The back side of the pillow did not show well in a photo but it is a hand quilted in a feather heart pattern. The fabric on the back is pink with polka dots. I got a good mark on the project. The only trouble I had was that I sewed the two sides and the lace by machine, then turned it right side out and stitched by machine the hole closed. It was stitched kind of sloppy and the lace was pulled funny in the corners. I would fix it but then it would not be my first project. My dear mom was a great helping hand on this. 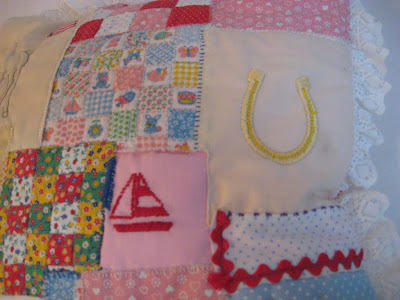 I remember her showing me how to transfer my quilting pattern to my fabric and to start to hand quilt. She did not do any of the stitching but was a great help.